Celebrating the life of Charles (Chuck) Eugene Land, Jr.
Be the first to share your favorite memory, photo or story of Charles (Chuck). This memorial page is dedicated for family, friends and future generations to celebrate the life of their loved one. 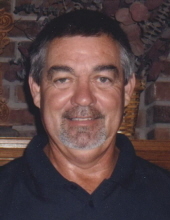 Obituary for Charles (Chuck) Eugene Land, Jr.
Charles (Chuck) Eugene Land Jr., Webb City, MO was born January 11, 1960 and went home to Heaven March 25, 2019. Chuck graduated from Webb City High School in 1978 and attended Missouri Southern on a golf scholarship. He was currently employed by the Joplin School District in construction. He was involved with construction all his life. Chuck loved God, his family, and friends, golf (3 Hole in Ones), attending sporting events, playing cards, and his pets, especially White Paw. Chuck and Lisa Hughes Land were united in marriage September 11, 1981 and she survives of the home. Additional survivors include son Zac Land (Anna), daughters Ashley Land and Darci Land of the home, grandchildren Grayson and Teagan Land. He is also survived by his sisters, Brenda Overman and Teresa Webber, (Steve); and many additional family members as well as many great friends. Chuck was preceded in death by his son Tyler Land and parents Charles and Glenna Land of Webb City, MO. The family will be present for a visitation on Wednesday, March 27, 2019 from 5:00 PM to 7:00 PM at Simpson Funeral Home in Webb City. A funeral service will be held on Thursday at 10:00 AM at the Carterville Christian Church. In honor of Chuck and at the request of his family, no flowers please, just do something kind for someone. Services are under the direction of Simpson Funeral Home in Webb City. Visit www.simpsonfh.com for online condolences. To send flowers or a remembrance gift to the family of Charles (Chuck) Eugene Land, Jr., please visit our Tribute Store. "Email Address" would like to share the life celebration of Charles (Chuck) Eugene Land, Jr.. Click on the "link" to go to share a favorite memory or leave a condolence message for the family.